Developmental Stages and How that Correlates to Learning Parkour. When different age groups are learning a physical art, there are different concepts they have to focus on. These concepts are built around their emotional, mental, and physical development. 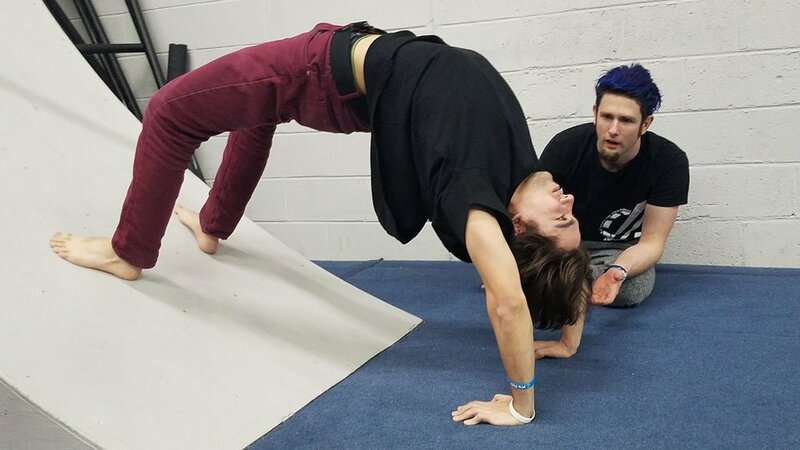 With every discipline comes a different skill set, but for this article, we are going to specifically focus on how different age groups should go about learning parkour. The first age group to cover is Tots (3 Yrs - 6 Yrs). Any child younger than three is probably too young to benefit from learning parkour in a traditional class setting, for children 0-3 Yrs, the best learning tool is playing, let them run free and enforce very basic safety rules. For tots an important focus is fun: if they are having fun, they’ll keep playing, moving, and learning. When telling tots to warm up their elbows they might move their arms at the shoulders, this is because they have not yet fully developed the part of their brain that is associated with fine motor skills and movements. Until they have more control over their fine motor skills tots need to have their bodies guided for them to perform a specific physical action. If tots stop having fun they’ll stop moving, and that’s the worst possible thing for them. They will also need to develop discipline, which will, in turn, propel their learning and their overall success. Just staying in line and waiting their turn is a task at this age, but by encouraging them to stand in line and watch and cheer on their fellow classmates they will learn how to stay engaged even if they are not physically participating at that exact moment. Fear at this age is also a huge factor in their learning and development. Each child has a unique and extreme level of fear. Some children are fearless, some are afraid of not being able to see their moms, others are afraid of what we perceive as minuscule movements. Developing tactics to work with each type of fear is key in helping each child develop a mastery of their bodies and skills. Wielding children is an appropriate way to help them overcome their fears. After our tots, come our Kids (Aged 7-11). At this age, the kids now have a substantial awareness of their bodies and have developed extensive fine motor skills.In some cases, they are very adept and agile with them, in others, less so. Like the tots, kids still need to have a focus on fun in their training, otherwise, they may lose interest in continuing. However, unlike tots, this is a critical time in their emotional development where they need to develop discipline and commitment to help them further their skills. Along with a rigorous focus on commitment, and overcoming mental barriers, comes a reformed sense of technique and skills. Now is the time that they can start to comprehend the underlying concepts and physics behind each technique they learn. They will also begin to develop a training routine, that involves warm ups and cool downs, taking classes, working on their own, and stretching. Next up are the Teens (Aged 12-17). Young teenagers are approaching their peak physical form, and can now start training very hard. At this age, they have matured mentally enough that they can focus on movement and technique for extended periods of time, without direct coach supervision. However, with adolescence comes the need to explore and push boundaries. One of the tallest hurdles for teens isn’t always discipline, it is more often respect for movements that tend to be lacking. They are at a point where most moves are becoming easier and they feel more comfortable with their bodies. When this happens it is also easier to fall into the habit of wanting to show off and push yourself to do more impressive movements. This is when you will get hurt. A major aspect of working with teens is to teach them to respect the movements and themselves. With a respect for the moves and their bodies, they will be less likely to get hurt by showing off or by doing a movement they are not necessarily ready for. Stretching is incredibly important as you go through puberty, if you don’t stretch, you’ll start to build muscle while working out, but your muscle will be tough and inflexible; this will cause issues later in life with mobility and it will be incredibly difficult to regain that flexibility later on in life. At this point, new techniques are still easily learned, and mental barriers are still (relatively) easy to overcome, this is when people should hone in on their skills training, and start to dabble with light strength training. After teens come the ‘Young Adults’ bracket. This is the age range from about 18-30. Once someone has hit this group, they likely have pretty good emotional control and can focus on challenges for long periods of time with ease. They are quite mature and can comprehend concepts behind movements. Strength training can now enter full swing, you can put on all the muscle you want, as long as you’re putting in an equal effort to your stretching and mobility. Skills are still a top focus, but now you are reaching your maximum power, this is the point where you are the strongest and can jump the farthest. This is the time where you can maximize your power and should be going for your max jump. Because this is a wide age range, an 18-year-old may function very differently than a 30-year-old, especially when it comes to recovery times. At this age range you start to see an increase in rehab times, and overall your healing speed will slow down. We can now round up the article with the Adult (30+) bracket. At this point, you can absolutely still focus on pushing your skills and developing strength, but you need to be aware of the increasing fragility of your body. You can no longer go for maximum impact care-free and must consider the potential damage you are sustaining. There should be an increased focus on intricacy in movement and on specific techniques to help with longevity. Your bones may not be as strong as your earlier years of training, so take this into account when preparing for high impact movement. Now is the time to focus on technique, relearn some lost skills and start managing how much volume you are incorporating into your routine. With every age group comes different strengths, and weaknesses. With the tots, it's important to focus on learning discipline, basic motor skills, and overcoming fear. When it comes to kids, they need to start honing in on their skills and techniques, while continuing to focus on learning discipline, focus, and still head-on battling their fears. Teens can start to strength train in moderation, as long as it’s matched with equal mobility training, teens are also at their peak ability to learn intricate techniques, and skills. Young adults are at their maximum strength, and can strength train without serious inhibitions, they can jump the farthest they ever will be able too, yet are starting to heal slower. The Adults need to start focusing on more intricate movements, instead of favoring high impact/maximum power jumps. These age ranges and advice are just a general guideline and should be taken with a grain of salt, everyone has a different body and progresses at different rates. Always train the way that's smartest and best for you. Older PostParkour Jams V.S Tricking Gatherings... What's the difference?